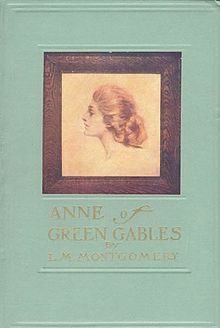 Anne of Green Gables first edition cover. Anne of Green Gables is a book by Canadian author Lucy Maud Montgomery. It was published in 1908. It was written as fiction for readers of all ages. Since the middle 20th century it has been classified as a children's book. Montgomery wrote the book after seeing a newspaper article about a couple that were mistakenly sent an orphan girl instead of a boy, yet decided to keep her. The book takes place on Prince Edward Island, Canada, where the author grew up. Montgomery continued the story of Anne Shirley in a series of sequels. They are listed in the order of Anne's age in each of the novels. Wikimedia Commons has media related to Anne of Green Gables. Anne of Green Gables at Project Gutenberg. ANNE OF GREEN GABLES Hypertext formatted version of the Project Gutenberg edition. This page was last changed on 16 August 2018, at 02:27.